The town of Cusco centres around its main square the Plaza de Armas and radiates upwards and outwards on three sides. Deep red terracotta tiled roofs march up the steep hillsides whilst dark skinned small people stroll around bent under their heavy loads. Everybody seems to be carrying something on their backs stuffed into brightly coloured blankets. Babies, shopping and firewood are tied tightly in place and women with oversized bowler hats perched on top of long hair tied back in plaits stand or sit on street corners and stare as life passes by. We spent a few days getting our bearings and then me, G, and now H and C – our new band of happy travellers set off early one morning for the Sacred Valley. We had hired a private taxi and set off for the Sacred Valley. Once we got him talking, Ronaldo turned out to be a real gem. He took us to Moray first. 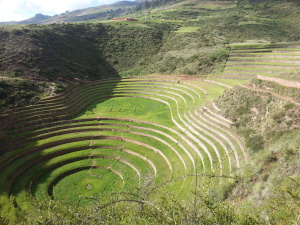 Moray consists of three massive terraced amphi-theatres set deep into the hillside. 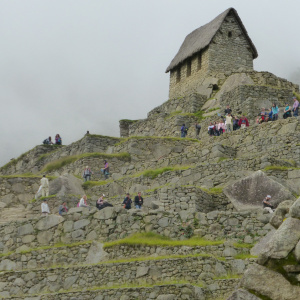 The bowls are suspected of being crop laboratories where the Incas would have experimented, growing different crops at differing altitudes in little micro climates. The bowls were very simple structures with nothing fancy to see, but were strangely interesting, carved into the mountain. Our next stop was supposed to be the Salinas – a terrace of salt pans but Ronaldo assured us that they were not very spectacular at all now that the rainy season had begun and instead of the sparkling white terraces, they would be brown and yellow. 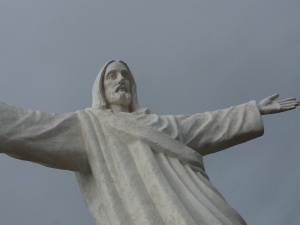 We followed his advice and instead he gave us a bespoke tour of the Sacred Valley, stopping at view points to point out the history, geography and nature of the area. A couple of days later I was chatting to a Korean in our hostel who showed me his photographs of the Salinas. Ronaldo had been quite correct and they were not especially spectacular. They would not have compared to Pamukkale in Turkey where the blinding white calcium deposits spill down the hillside and the iridescent ice blue water glimmers in the sunlight and which I had paddled in a few years ago. I distinctly remember the pictures on the news nearly four years previously in the rainy season and as these pictures from the BBC show, it is a wonder that more people didn’t die. 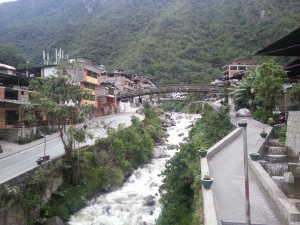 The river is a noisy, fast flowing beast contained by the steep valley walls and dominates the town. At four am the alarms woke us up and we set off to get onto one of the first buses of the day. 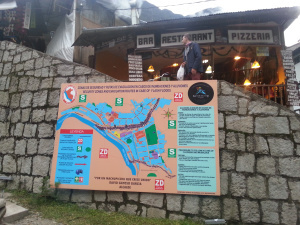 A convoy wound up the tight hairpins on the mountainside and then pulled into the car park at the top. We queued up to show our tickets and our passports and then we were in. My reliable Lonely Planet advised us to swing a left at the entrance and to climb. We did, albeit slowly as we were all suffering from the altitude and as we rounded the corner at the top, we were rewarded with the classic view above the ruins. Photographs cannot do the place justice. If the ruins were placed in a field they would be special but set high on a plateau with towering mountains clothed with dense green jungle looming above, and the edges of the settlement scooping down to the river which looped far below, it is magical. We had arrived before the crowds and could spend a good half hour sitting quietly and absorbing the energy of the place. And it does have an energy. 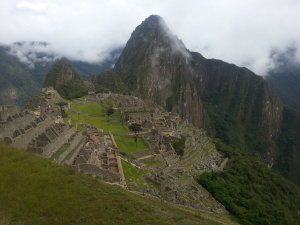 I don’t know if it is because of the mountains which surround it or the remoteness of the place, but probably because it has long been my dream to visit Machu Picchu and Peru – I felt such an elation and achievement to have finally arrived. The following day was Christmas Eve and the Plaza de Armas was converted into a massive street fair with hundreds of people flocked in from the surrounding countryside. 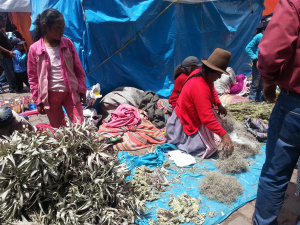 Stalls were selling the usual alpaca goods but there were also peasants from the country with piles of dried grasses (apparently medicinal plants) and men nailing together miniature wooden stables for people’s nativity scenes. The poverty was tangible as women with grubby babies strapped to them squatted under the arches where they would later settle down to sleep. Smoke from the many food carts hung over the square but even a sudden sharp downpour couldn’t put off the crowds as whole families came to buy their Christmas gifts. I visited the Inka museum and later that evening a few of us gathered for a meal on the outskirts of the town. A couple of the volunteers from the NGO were also in town for Christmas and were staying with their friend from their home town of Madrid who was living and studying in Cusco. They had prepared an amazing meal of typical Spanish foods which we washed down with plenty of wine, the language swinging between Spanish and English. At midnight on Christmas Eve families in Peru typically sit down to their Christmas dinner and let off a barrage of fireworks which resounded around the valley for the next hour or so. On Boxing Day I discovered a quiet little backstreet vegetarian restaurant and I had a Mayan hot chocolate in the Cocoa museum – hot chocolate with honey and chilli. I wanted to spend a quiet day alone as I had struggled a bit the previous day with the emotions of Christmas and being apart from my children and friends. I needed some time out to sit and think. I have come on quite a journey but I think constantly of my children back in the UK and I would love to be able to share my experiences with them. Oh my, what an amazing post! So sorry to hear of your emotional struggle on Christmas day, and I hope it’s the last time you ever have to feel like that. The rest of it though … wow! Scary about the toddler under the bus, but it sounds as if the parents are used to it, and I suppose when we were kids ourselves we did some pretty stupid stuff – it’s a miracle many of us are still around to tell the tales! Gorgeous photos, wonderful descriptions, these just keep getting better!